Why not brighten up your home with realistic fake grass for your front yard that’s not only low-maintenance, but looks luscious and green all year round? Our fake grass eliminates drainage issues, and can’t be stained by your pets, so you can enjoy your front lawn whenever you like! Are you thinking about investing in fake grass for your front yard? If you’re feeling stuck with the same old patchy grass or dull stone chips, artificial grass can help to transform your outdoor space, and make your front garden look attractive all year round – whilst being extremely low-maintenance. Not only does it keep the neighbours happy with very minimal effort, it could even add value to your home, and give a great first impression to potential buyers! You can also use fake grass to cover up unsightly man-hole covers, which are an all-too-common feature in many front gardens (although recessed man-hole covers may be necessary to complete the overall look). 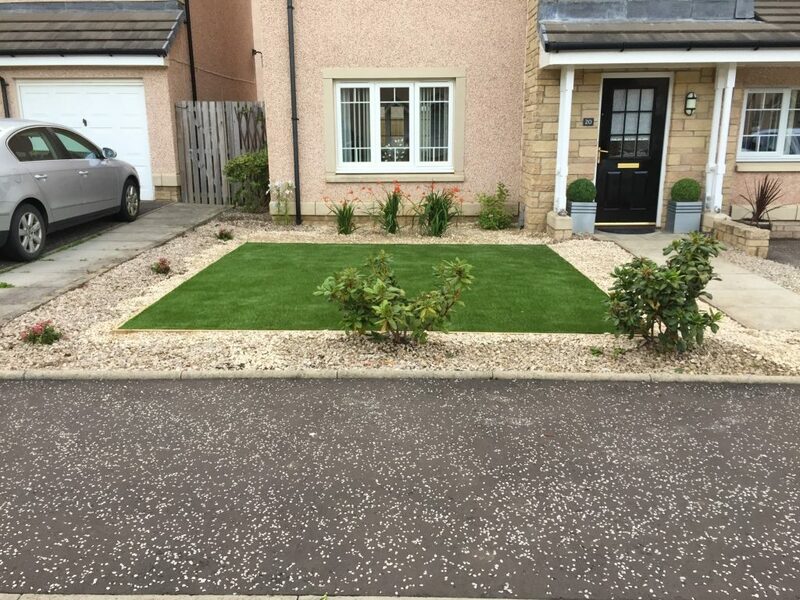 Here at CLS, we carry out a lot of fake grass installations in front gardens all over central Scotland – for many of the above reasons. We usually replace existing real grass lawns, or chipped areas, which can often be much higher maintenance to look after. What’s involved when installing fake grass for your front yard? When installing your artificial grass, a specialist will carry out a full excavation of the existing surface area, and install a fully-permeable sub-base along with all the necessary layers required for your new lawn. This can help to combat drainage issues and ensure your lawn dries quickly after heavy rainfall. Alternatively, we could carry out a dry fit installation over decking or paving, as long as your surface is level and in good condition. A shockpad layer is also an option if you want to create a safe, soft space for children to play on – and pets love it, too! Love the idea of not mowing your lawn, but still like to do the odd bit of gardening? Flower beds or borders can be also be an option for your front yard, and will make your garden look great whilst also reducing the cost of your fake grass installation. The average front garden installation takes around a day to complete, and shouldn’t disturb your neighbours. All materials, skips and equipment should be stored in your driveway (depending on space) and professional fitters will do their best to cause as little disruption as possible. If you’ve decided on fake grass for your front yard, the best thing to do is to contact an artificial grass specialist who can help advise you on your next steps – preferably one who is willing to show you customer testimonials and examples of their previous work. 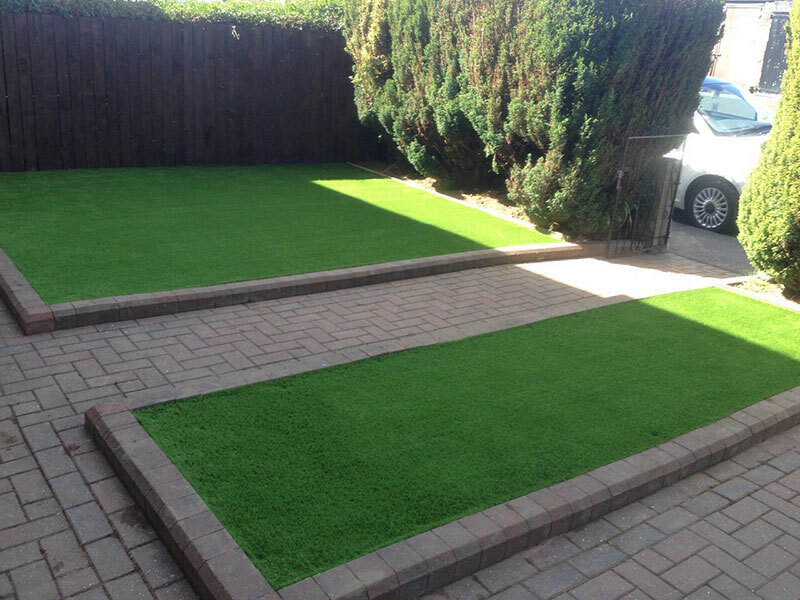 Want to know more about your options for installing artificial grass in your front garden? Luckily, our friendly team are on-hand to help, and we’ll be happy to advise you with a no-obligation consultation, or home visit – where you’ll be able to see some of the realistic fake grass samples in our range. We’re here to help you make the right choice for your front garden, and will deal with your enquiry in a professional and timely manner – from your initial contact, right through to our thorough aftercare service.